Today, UC Berke­ley and most insti­tu­tions are finan­cially invested in destroy­ing our future. This may sound a lit­tle bit sur­pris­ing to some — even unfounded. Let me explain. When it comes to cli­mate change, the sci­en­tific com­mu­nity has pre­sented a clear, unam­bigu­ous mes­sage: Human burn­ing of fos­sil fuels — coal, oil and nat­ural gas — is putting our world at risk. And this, in fact, is a need­less risk. By imme­di­ately reduc­ing green­house gas emis­sions, we can reduce the dam­ages that we are cur­rently on the path to cre­at­ing. Typhoon Haiyan, Hur­ri­cane Sandy, Hur­ri­cane Kat­rina and many of the costly recent fires and droughts around the world have been exac­er­bated — caused, to one degree or another, by the changes in the cli­mate that our reliance on fos­sil fuels has caused. Though UC Berke­ley and the UC sys­tem are lead­ers in address­ing the cli­mate cri­sis through ground­break­ing research and edu­ca­tion, the com­pa­nies they have invested in con­tinue to leave a sig­nif­i­cant “car­bon sig­na­ture” on the envi­ron­ment. Many of these invest­ments were made before the full impact of these choices on the cli­mate was clear. Con­tin­u­ing the finan­cial invest­ment in com­pa­nies like Exxon, Chevron and Cono­coPhillips — even though some of these com­pa­nies have made a start in green­ing their port­fo­lio — sends the wrong mes­sage. These com­pa­nies, and many more, have the capac­ity and the oppor­tu­nity to evolve from stal­warts of the old energy order that must change, into sup­port­ers of a new clean-​​energy sys­tem that Cal­i­for­nia and the world des­per­ately need. The 200 largest fos­sil fuel com­pa­nies hold, in the form of projects and assets, about five times the amount of car­bon in their reserves that the sci­en­tific com­mu­nity has deemed respon­si­ble to even con­sider burn­ing in order to avert run­away cli­mate change. The sev­eral thou­sand researchers on the Inter­gov­ern­men­tal Panel for Cli­mate Change have deter­mined with greater than 95 per­cent cer­tainty that human activ­ity is cur­rently caus­ing cli­mate change. Researchers from across the entire UC sys­tem and our state gov­ern­ment are crit­i­cal lead­ers in efforts to advance both cli­mate sci­ence and cli­mate solu­tions, as well as the adap­ta­tion side of the equation. The over­whelm­ing major­ity of major energy com­pa­nies, how­ever, has shown far too few signs of tran­si­tion­ing to low-​​carbon projects. The fos­sil fuel indus­try col­lec­tively spends more than $600 bil­lion per year explor­ing for new hydro­car­bons and, in some cases, very sig­nif­i­cant amounts of money on cli­mate denial, lob­by­ing Con­gress to main­tain fos­sil fuel sub­si­dies and other efforts that work against the needed and fea­si­ble clean-​​energy tran­si­tion. These com­pa­nies are pub­licly traded and investor-​​owned, sup­ported in large part by insti­tu­tional investors like UC Berke­ley and the Uni­ver­sity of California. Instead of fund­ing the prob­lem, we should be invest­ing in solu­tions that at once aid the tran­si­tion to a low-​​carbon econ­omy and grow our university’s bot­tom line. There is no lack of finan­cially and envi­ron­men­tally sus­tain­able rein­vest­ment oppor­tu­ni­ties; as of yet, there is only a lack of leadership. UC Berke­ley has played a vital role as a leader in finan­cial and social account­abil­ity. When other insti­tu­tions refused, the cam­pus lis­tened to its stu­dents and the inter­na­tional calls for divest­ment from com­pa­nies tied to grave social harm and injus­tice. As was sim­i­larly expressed dur­ing the South Africa, Sudan and tobacco divest­ment cam­paigns, stu­dents at UC Berke­ley believe that their campus’s invest­ments should reflect its val­ues of social respon­si­bil­ity and envi­ron­men­tal sustainability. In the case of fos­sil fuel invest­ments, divest­ing is not only the moral thing to do but is also finan­cially pru­dent. As fos­sil fuel com­pa­nies con­tinue expand­ing their search for more hydro­car­bons, the world’s car­bon bud­get is shrink­ing. From Cana­dian tar sands to shale oil, the ”bot­tom of the bar­rel” is prov­ing to be increas­ingly dirty. When gov­ern­ment reg­u­la­tion aligns with this real­ity — and it must — the vast major­ity of reserves will have to stay in the ground unburned, ren­der­ing them stranded assets. Remain­ing invested in fos­sil fuels is a bad bet all around. 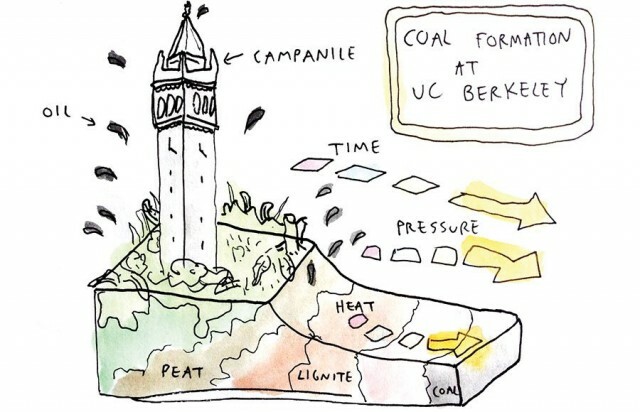 With a new chan­cel­lor at UC Berke­ley and a new UC pres­i­dent, both of whom are lead­ers in clean energy and cli­mate pro­tec­tion, divest­ment at UC Berke­ley and across the UC sys­tem will send a resound­ing mes­sage that the uni­ver­sity takes all facets of its lead­er­ship posi­tion seri­ously. It will also encour­age other insti­tu­tions to do the same and build pres­sure for regional and global cli­mate action. As a fac­ulty mem­ber who under­stands deeply the chal­lenge cli­mate change poses and the urgency with which action must be taken, I call on my fel­low fac­ulty to stand with the stu­dents of Fos­sil Free Cal and Fos­sil Free UC in call­ing on Chan­cel­lor Dirks, Pres­i­dent Napoli­tano and the pres­i­dent of the Berke­ley Foun­da­tion to be on the right side of his­tory by mov­ing our endow­ments away from fos­sil fuels and rein­vest­ing in a sus­tain­able future. Visit fos​sil​freecal​.org and sign on if you are as con­cerned as I am. Daniel M. Kam­men is a dis­tin­guished pro­fes­sor of energy in the Energy and Resources Group and in the Gold­man School of Pub­lic Pol­icy and is the envoy to the Amer­i­cas for Clean Energy and Development.